The World Council of Churches (WCC) wants to make its Ninth Assembly in Porto Alegre, Brazil, a space where young people are welcome and enabled to speak - and be heard. "We are doing our best for young people to have as much of an impact as possible," says Natalie Maxson, the person responsible for the WCC's youth programme. "In the beginning, we had to keep on knocking at the church's door," says Wagner Hadlich, a member of the JEPS (Juventude Evangélica da Paróquia do Salvador), the youth group of a Lutheran congregation in Porto Alegre. "No one was against our activities, but we had to keep on reminding the parish council: 'Don't forget us! We are here, and we need your support.'" In the end - as happens in local churches all around the world - it was the congregation which benefited from the creativity and dedication of its young members: "The biggest challenge was to keep young people's interest in faith-based activities," says Wagner. "We invented a whole bunch of dynamic games and entertaining ways to meditate, composed new songs, and kept on inviting friends from school." The group became a success that grew well beyond the limits of the particular Lutheran congregation, including also other Protestants, Roman Catholics, and people who otherwise would never have visited a church. Many young people from Christian youth groups like the JEPS will visit the WCC's Ninth Assembly, taking place in their home city next February. And as they do in their own congregations, they will try to make their voices heard in the world-wide ecumenical community. They will join a youth camp, or participate in an "ecumenical conversation" or a Mutirão workshop, giving their opinions about the presence of youth in the churches. "Only young people can bring the kind of fresh energy to the Assembly that we need to develop new perspectives and vision for the ecumenical movement," says Natalie Maxson, WCC's programme executive for youth. "Some will come with fresh eyes and can point out the shortcomings of our churches and the ecumenical movement. Others will be well-seasoned leaders with unique expertise on human rights, inter-religious dialogue, economic justice, HIV/AIDS and other issues facing youth in their contexts." 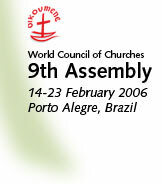 WCC wants to make this "the youngest Assembly in its history". The ambitious goal is to have 25% of young people between 18 and 30 among the delegates. So far, its member churches have nominated far fewer young people, more or less the same percentage as at the last Assembly in Harare 1998 (14%). But even this can be seen as a small success, because the total number of delegates per church is reduced by almost one-third, which makes it even harder to get youth into the smaller delegations. Right now the spaces for youth to have a strong impact on the Assembly are being created. There will be a three day pre-Assembly youth event, gathering young delegates and stewards to develop ideas to be brought to the Assembly. "There, we will build a strong community together. This is an essential source of support and sense of 'home' within a major event like the Assembly", Maxson says. A further 250 young people from Latin America will get together at a youth camp during the Assembly. Cláudio Becker, the Brazilian Assembly youth coordinator, calls the camp a 'trademark' of the events involving youth in Brazil. "The purpose of the youth camp is to build a space for gathering, formation, empowering and celebration. It will be a place for the young people to 'show their faces' and make their voices heard," he says. Of the 150 young stewards helping in all the operational tasks of the assembly, 30 will come from Brazil, 20 from other countries in Latin America and 100 from the rest of the world. Their backgrounds are extremely diverse and range, for example, from that of a software engineer from the Middle East, to an Orthodox woman studying business in Canada, to a cattle farmer and a government expert for seaweed from Fiji, to that of a Christian youth worker from Brazil. As far back as the 19th century, it was actually young people who started the ecumenical movement - in the Student Christian Movements, YMCA, YWCA - taking leadership and daring to challenge the churches. A good example of ongoing ecumenical commitment will be given by the World Student Christian Federation, which holds its executive committee meeting in Porto Alegre just prior to the Assembly. During the Assembly, delegates and official participants will gather in 22 "ecumenical conversations", designed to provide opportunities for discussion among the delegates on significant issues. One of them will be on "Youth transforming the ecumenical landscape," and will focus on how young people and organizations like the Student Christian Movements can contribute to the unity of the churches. But young people will not only contribute to this particular ecumenical conversation. Although the debates are restricted to the churches' official delegates, there is an exception: every young person participating in the Assembly, in no matter what capacity, can take part in all of the discussions. "We don't want youth to speak to the Assembly, but rather the Assembly to speak with a youth voice," concludes Maxson. "For me, this paradigm honours and recognizes that we, the youth, are the church and the ecumenical movement." (*) Gustavo Bonato from the Evangelical Church of the Lutheran Confession in Brazil graduated in journalism at the Pontifical Catholic University in Porto Alegre, and has worked as a journalist for three years. He is currently working in Geneva in the Assembly Office as a WCC intern.